I was seriously happy when I started seeing donuts appearing at weddings, bridal showers and occasions other than work meetings. I’ve always felt those sweet, fluffy rings of dough had a higher calling. They had such potential! And honestly who doesn’t love donuts? 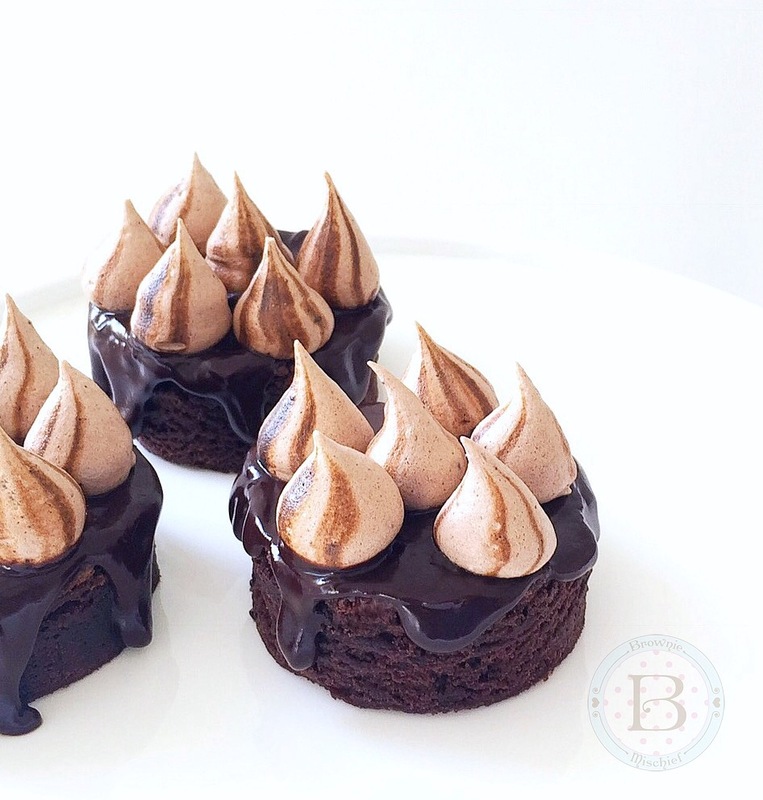 They’re delicious, but they can also be beautiful. 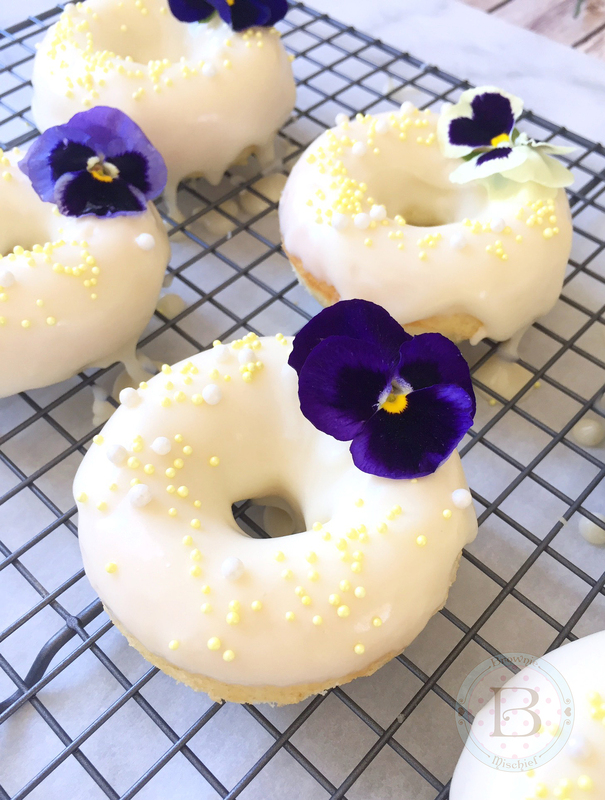 These Lemon Buttermilk Donuts could certainly win a beauty contest. 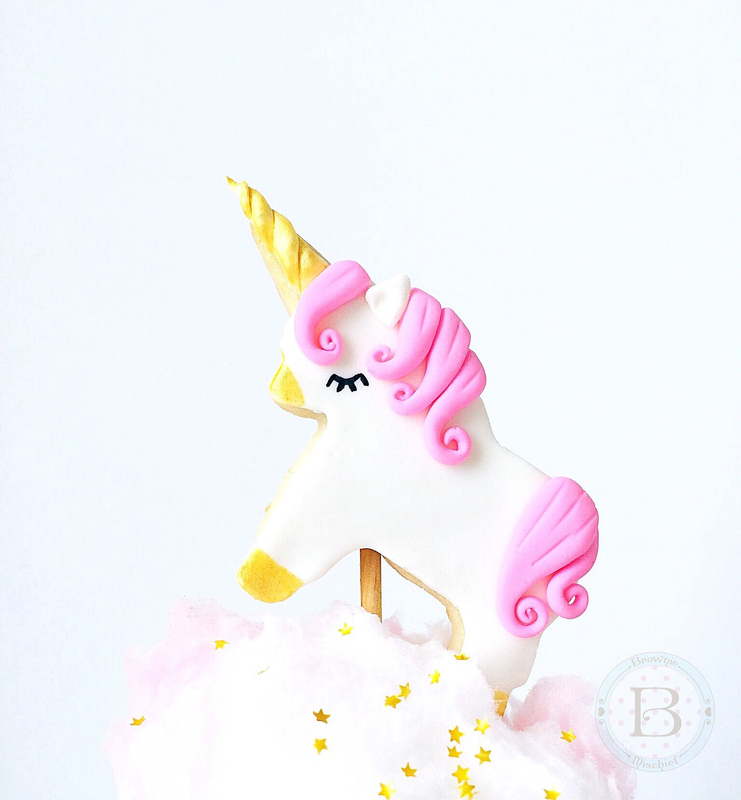 They would make a gorgeous edition to any breakfast, brunch or dessert table. The fresh lemon zest and the earthy flavor of honey will bring springtime right into your kitchen. If you’re on the lookout for a Mother’s Day recipe, any mom will love these pretty, fragrant treats. 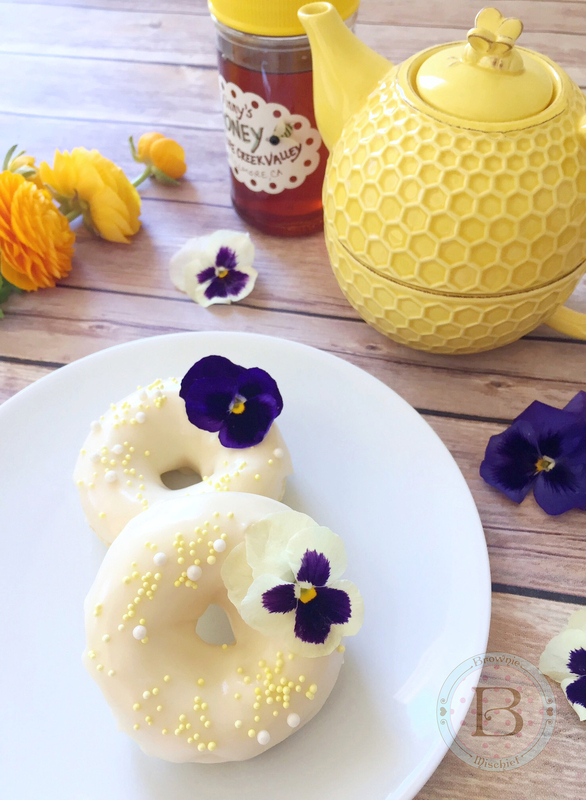 This is a very easy recipe and the donuts bake up quickly, so you’ll have time to fix mom a cup of her favorite tea. If you don’t have a donut pan, and you’ve been reluctant to buy one, I can honestly say I love mine. It was very affordable and I’m pleased with the performance and ease of clean up with the pan I purchased. To find the donut pan click here. 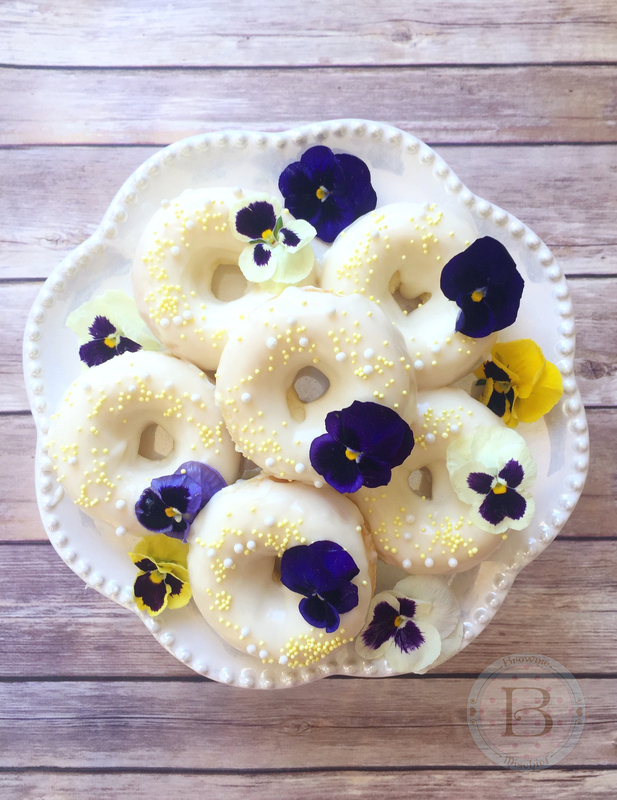 In keeping with the springtime feel, I decorated my donuts with pesticide-free edible flowers. I used pansies, but if you’re unable to find them, you can substitute pesticide-free rose petals. I found these edible pansies at my local food market in the produce department, near the fresh herbs. You can also find edible flowers at farmers’ markets and online. For a list of edible flowers, click here. Note: The above pictured orange ranunculus flowers on the table are not edible. Preheat oven to 425ºF. Spray the wells of a ***donut pan with non-stick cooking spray. In a medium bowl, whisk together cake flour, sugar, baking powder and salt. In a small bowl, whisk buttermilk, egg, melted butter, and lemon zest together. Add to flour mixture and stir until combined. Transfer batter to a piping bag or plastic zip bag. Snip off the tip of the bag and pipe batter into prepared donut pan, filling the wells 2/3 full. Bake for 7-8 minutes or until toothpick inserted into donuts comes out clean. Let cool in pan for 5 minutes, then remove donuts to a rack to cool completely. 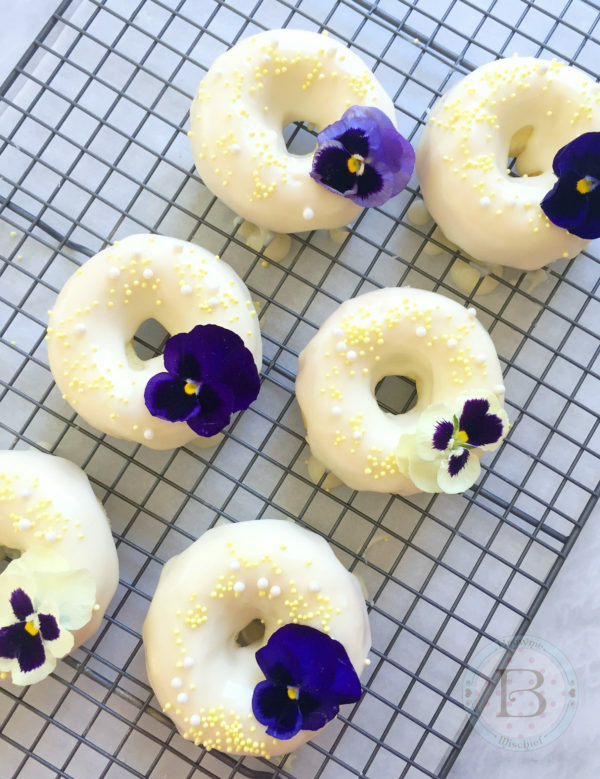 Prepare Honey Cream Cheese Icing while donuts are cooling. Dip tops of donuts into icing and decorate as desired. Serve immediately. In a medium bowl, beat cream cheese and butter with an electric mixer at medium speed until smooth. Add vanilla extract and salt. Mix until combined. Add powdered sugar and mix on low speed until moistened. Turn mixer up to medium speed and mix until combined. Add honey and beat on medium speed until smooth. Add milk, a little at a time until desired consistency is reached. Beat until smooth. *To find sugar pearls, click here. 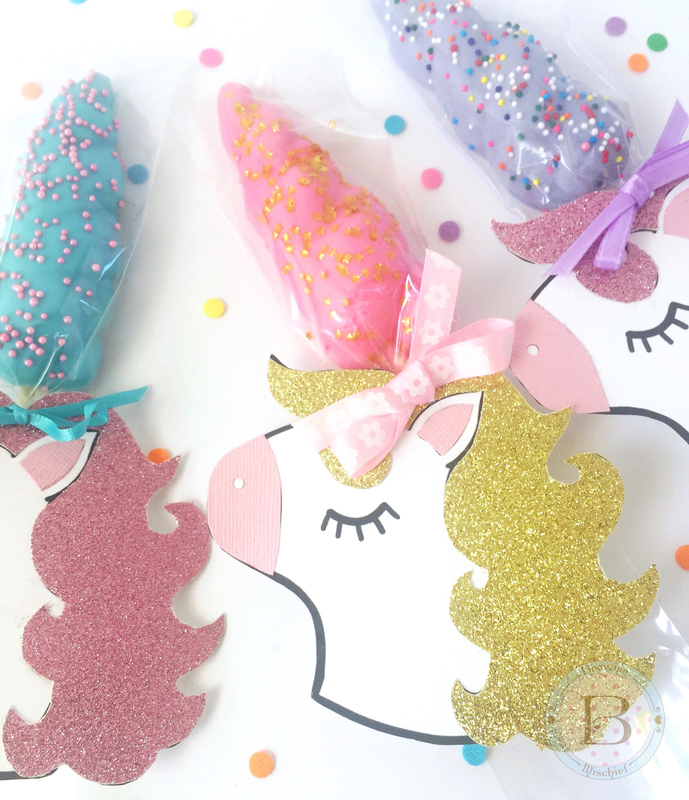 **To find nonpareils, click here. ***To find the donut pan, click here. To find the Bee Teapot click here. Enter your email address to subscribe. Receive notifications of the newest posts!